Based on the discovery of polarography78 by the Czechoslovakian chemist Jaroslav Heyrovsky in the early 1920s, solid platinum (Pt) microelectrodes were developed 20 years later by Davies and Brink to facilitate in vivo local oxygen pressure measurements. In 1956 Clark presented a rapidly measuring electrochemical cell which has been used in blood gas machines and oxygen monitors since then. In 1972 Huch modified the Clark electrode for non-invasive transcutaneous use79 which was easy to introduce into the hyperbaric chamber and which became a most valuable monitoring tool in the clinical routine. 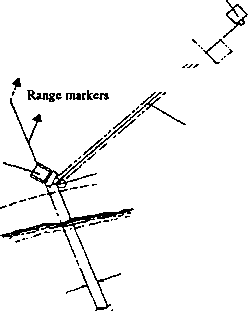 A Clark oxygen electrode consists of two half cells separated by a salt bridge. 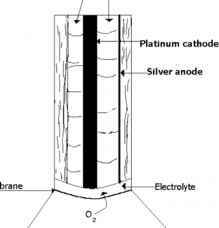 A platinum electrode is separated from a solid silver electrode. The electrodes are surrounded by a concentrated potassium chloride solution. The oxygen monitor holds a constant voltage difference between both electrodes so that the platinum electrode becomes the cathode (negatively charged) where electrochemical reduction takes place, and a current flow develops from the silver electrode to the platinum electrode. The current generated by the reduction of oxygen is proportional to the number of oxygen molecules entering the chamber between anode and cathode through a membrane permeable to oxygen molecules. The electrode is heated in order to obtain more reliable oxygen tension values by vasodilatation and improved diffusion of oxygen out of the tissue beneath. It is attached to the skin by an adhesive ring filled with a contact solution. A miniature tube with a wall permeable to gases is inserted into the tissue and filled with anoxic fluid. The tissue oxygen tension in the fluid becomes gradually equilibrated with the tissue oxygen tension of the adjacent tissue and can be determined after about 5 to 10 minutes of equilibration. Korhonen80 performed measurements of tissue pO2 and pCO2 with an implanted Silastic tonometer and a capillary sampling technique which proved reliable and appropriate for use under hyperbaric conditions. They collected the sample fluids in glass capillary tubes which were sealed and stored on ice until they were measured in a blood gas analyzer. This method is amenable to institutions possessing of a blood gas analyzer and not very costly. It may be considered a drawback that the tissue is slightly injured after insertion, which might influence the values obtained.